Being a steward of both the land and cattle on 3D Cattle Co. in Southeast Alabama is not just a livelihood for Bret Dalrymple, but a way of life that’s been passed down through the generations and one that he is working to pass down to his children. He knows that healthy cattle gain more efficiently. And healthy cattle that gain more efficiently, require less feed to put on more weight, meaning that the feeder is saving money on feed and on treating sick cattle. For Dalrymple, herd health is a top priority in both his cow herd and his stocker operation. He runs about 325 Angus-based mama cows and backgrounds about 2,000 calves each year. One of the key components to his nutrition plan is having a high-quality mineral program that works in concert with his vaccination program to keep those cattle healthy and performing. “I’m a big believer in minerals. My cattle have mineral in front of them 24/7,” Dalrymple said. A mineral program is an investment at the 3D cattle enterprise. Dalrymple said he doesn’t necessarily select a mineral based on pricing, rather the benefit it adds to the cattle – both his cows and his stockers. For his cow herd, having a healthy herd with ideal conception rates and weaning percentages is his goal. He then takes those weaned calves and adds them to his stocker operation and buys more calves, to reach the 2,000 head mark. Making sure those calves are in optimal health and growing to reach their target weights of 700 and 800 pounds for heifers and steers, respectively. Dalrymple started feeding the VitaFerm® Gain Smart® Stocker mineral about three years ago after learning about the benefits of the Amaferm® advantage from Rowdy Pope, BioZyme® Area Sales Manager. Since Dalrymple had just purchased a pallet full of his previous mineral, he decided to run his own research experiment on the Gain Smart Stocker mineral against his previous mineral where calves were in similar conditions. Amaferm, found in all Gain Smart products, is a precision-based prebiotic that impacts intake, feed digestibility and nutrient absorption for optimum gain. It fills in the nutritional gaps during grazing and includes organic copper, iodine and zinc for maximum availability and hoof health. Each year around June 1, Dalrymple switches his mineral program to a VitaFerm product with the HEAT® mineral, which still contains Amaferm, and also contains capsaicin to help maintain circulation to support animal performance and gain in both heat and fescue situations. Capsaicin is research-proven to support animals’ ability to maintain normal body temperature. HEAT also includes garlic, considered a natural insect repellent. Dalrymple noted a definite advantage to the HEAT mineral after doing his own comparison with HEAT mineral in a cross-fenced pasture. He said the calves that were consuming the HEAT mineral spent an additional 30-45 minutes each morning and afternoon out grazing, giving them the advantage in growth over the calves that stayed bunched up or shaded up. BioZyme offers two mineral options that contain the HEAT extract in it. 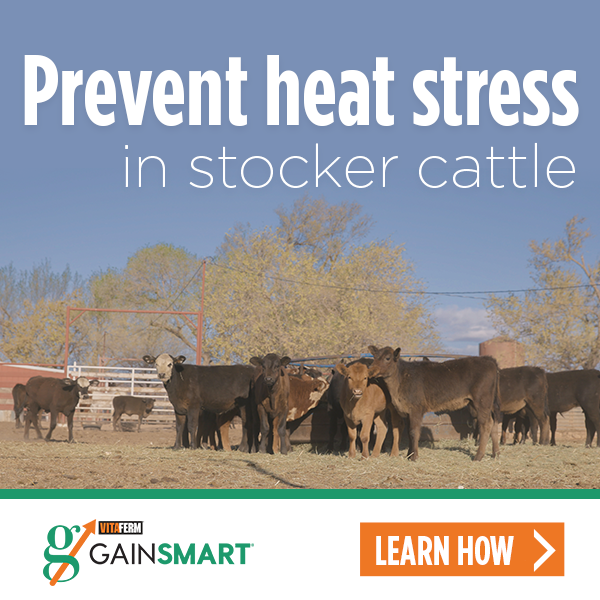 The Gain Smart Stocker with HEAT is specifically designed for stocker calves grazing forages. The VitaFerm HEAT mineral is designed for cow-calf producers who want to give their cows added comfort and help regulate their body temperature anytime temperatures get above 70 degrees or when grazing fescue. Dalyrmple knows taking care of the cattle is just the first step of making sure there is something to pass on to the next generation. And he knows if he provides a good mineral program and a solid health protocol, those cattle will take care of him. That’s care that comes full circle, and that’s what the Amaferm advantage offers through the Gain Smart mineral.